Like… YAY!! 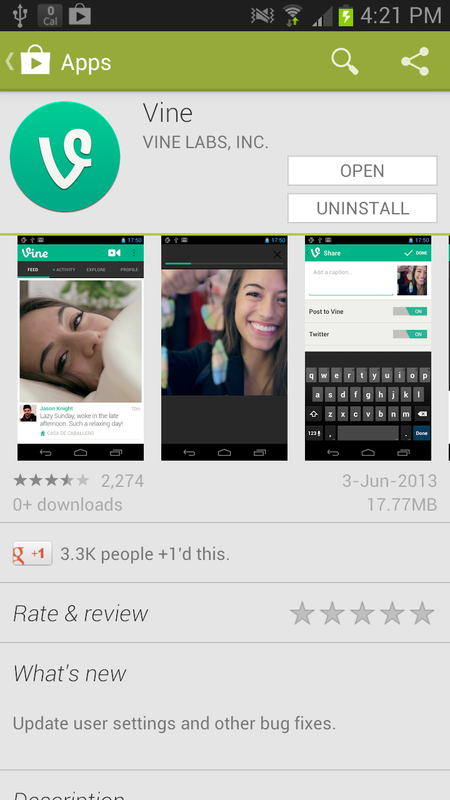 VINE IS NOW AVAILABLE FOR ANDROID! (Go download it now!) How awesome is this?? I’ve obviously haven’t been able to play with it much, but it was really simple to get film the video bit that I wanted. One thing I have noticed, ’cause I wanted to share my video through the Twitter embed function, is that my vine video didn’t tweet. Twitter is having issues today though, that may or may not have to do with Android users using Vine, so its possible that my tweet disappeared into the ether before it reached the masses. Ah well. I was able to upload it to YouTube though, ’cause Vine saves an .mp4 file onto your smartphone… which is finally a reason why I would consider going for bigger hard drive space on my phone (or at least ensure I can extend with an sd card.) EDIT: So the Vine tweet finally showed up, will have to find out if it usually takes a while or if this was just a one time thing. Are you on vine? Did you finally download the app today? Hahahah that’s nice the Canada dry thing. Well I don’t have Vine but a lot of my friends have been using it. Maybe I’ll download it in the near future. Still don’t own a mobile phone smart or stupid. I should probably be embarrassed to admit this, but I have no idea what vine is. I haven’t gotten on to vine yet. I am so technologically brainless that I am always 10 techno steps behind! It looks so cool though! Are you kidding? Did that really just happen? That’s hysterical. Thanks for showing us the Canada Dry surprise. I kept reading about it but no one said what it did. BTW, as soon as I read your post, I downloaded the Vine for Android. Thanks. Glad you liked the Real surprise and used it as your Vine start! That’s neat! Makes me realize how much I need to learn about technology. Vine looks really cool. Stopping by as a Biannual Blogathon Bash Team Member to say thanks for joining the event and we look forward to connecting with you.